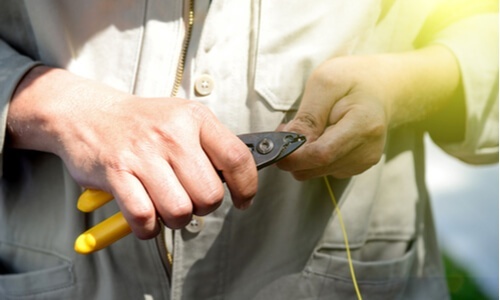 Regular training and education in cable installation offers a multitude of benefits, both for the installer and the customer, promising quicker, problem-free installations and fewer repeat service calls. In turn, this will lead to reduced costs for the service provider and more satisfied customers. In this blog post, we explore the key elements to look for when selecting additional training opportunities for cable installers. 1) Drop Connector Training - An understanding of proper drop connector installation practices (and the importance of properly tightened connectors) is another crucial key to problem-free installations. Drop connector training covers a range of “what-not-to-do” scenarios, including failure modes. PPC's training includes a drop connector tool audit to identify faulty, worn or dull tools, and to ensure compression and cable preparation tools are in working order. Additionally, our Tools for Life® customers receive replacement blades and tools, as needed. 2) Tool Audit - Defective tools are a major contributor to faulty installations and invariably, and leads to increased costs for cable providers. A tool audit is an essential element of any training program because of this. Maintaining high quality tools, and knowing how to select the right tools for the job first time, are simple and effective ways to avoid the inconvenience and cost associated with repeat service calls. 3) Drop Hardening Training - This type of training illustrates the importance of every connection for system performance, and helps define how a hardened drop can avoid additional truck rolls. It should explain the importance of improving the IFCR (In Frequency Channel Response) and overall drop plant integrity, as well as covering impedance matching, SNR and in-home performance. 4) Fiber Installation Training - With the U.S. fiber optic market predicted to grow to some $2.24 billion by 2020, an understanding of efficient and problem-free fiber installation is going to be even more important for technicians. Fiber installation training should cover the basics of fiber, including products used in the drop and FTTX applications. It should also provide an explanation of cable and duct applications, bend radius, optical termination options, tools and installation techniques. 5) Hardline Training - This training should encompass the mechanical and electrical functions, and feature of a range of hardline connectors. It should demonstrate correct installation techniques, highlight the importance of tool maintenance and tool inspection, and include the reviewing of failure modes caused by common craft errors. It’s also important for hardline training to include an explanation of adapters as well as their installation, function and features. 6) Entry Training - Entry training is essential for cable installers to ensure they know how to accurately determine which product is needed and when. It should ideally cover proper installation/wiring techniques, powering options and the importance of optimization within a MoCA network. 7) Line Conditioning Training - With more stringent requirements surrounding new DOCSIS platforms and delivering quality signals to an increased amount of RGUs, line conditioning has become a critical need. Line conditioning training should cover delivering signals within the operating threshold of the network, proper port terminations, MoCA filters, forward path attenuators, drop amplification and high-path filters. It should also explore frequency response adjustments across the entire bandwidth, and selection criteria for cable simulators and in-line equalizers. 8) Grounding and Bonding - It’s vital that cable installers know where and how to properly install cable hardware, and grounding and bonding products. This element of training should cover correct grounding and bonding techniques, as well as an explanation of failure modes and the liabilities associated with improper grounding. Many of the most effective teaching modules are based on the principles of Instructional Systems Design (ISD) which is all about creating instructional experiences that make the learning process appealing, efficient and relevant. You may find it helpful to check if your cable installation training provider follows a similar approach to their teaching. Finally, the training solution you select needs to be delivered by qualified instructors who have hands-on experience of installation and know how to troubleshoot any potential problems. Where possible, seek advice from the creators of the products you’re using, as they’ll be best placed to explain and demonstrate them. Relevant and customized training and education programs are essential to success for cable technicians. Ensuring your installers have the hands-on training and the correct tools for the job is vital to guaranteeing the quality of their installations, minimizing repeat service calls and offering the best user experience for your customers.